More on Pius XII's Worthy Successor: Gregory XVII "Siri"
Giuseppe Siri was born in Genoa on May 20, 1906. His mother was from a village near Forli, his father was from Liguria. At four years old, his parents decided to enroll him in elementary school, a sign of early intellectual development. Giuseppe grew quickly and his excellent academic results caught the attention of a friend of his father, a stockbroker, who promised to teach him his job in spite of his young age. After a few days Giuseppe Siri showed a strong disinterest in this activity, and shared this to his mother. He spent great amounts of time in fervent prayer at the oratory of the church in which he had been baptized, Santa Maria Immacolata in Genoa. At the age of nine, he expressed his intention to enter the seminary to become a priest. In 1916, at the age of 10, his parents allowed his entry into the minor seminary of Genoa, which was known for its strict discipline. Giuseppe distinguished himself by his quickness of thought and for excellent results achieved. Due to his signal successes, Cardinal Minoretti, Archbishop of Genoa, informed Giuseppe, and his parents, of his intention to send the gifted child to Rome, to study at the Pontifical Gregorian University. Giuseppe Siri, and sent him to Rome to study at the Pontifical Gregorian University. At the age of 22, he received priestly ordination from the hands of Cardinal Minoretti. On September 23, 1928, the day following the reception of the priesthood, he celebrated his first Holy Mass. The next year he graduated in Theology at the Gregorian University. From 1929 until 1946 he taught in Genoa. In March 1944, following a detailed report by Cardinal Boetto, Pius XII elevated him to a titular bishop of Liviade and auxiliary of Genoa. At the age of 47 he was named cardinal by Pius XII on 12 January 1953. During the pontificate of Pius XII, Giuseppe Siri remained very close to the Pope, so much so that His Holiness considered him a trusted adviser. Pius XII esteemed Sir's intellect and conduct to such an extent, that Pius XII decided to *designate him as a successor to his death. *Note: A Pope, the Supreme Lawgiver of the Church, can do this [name his successor] before he dies. This has happened in the history of the Church *previously. It is reported that Cardinal Siri, with great humility and respect, declined the offer from Pius XII, stating he preferred that a Conclave elect the next pope - to manifest Pius XII's desire. *On his deathbed in 530 A.D. Pope St. Felix IV designated a trusted friend and adviser as his successor (Boniface II). 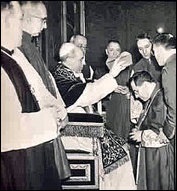 In 1958 Pius XII died. Many of the liberal cardinals criticized Pius XII's centralizing management, and feared that Siri would accentuate this behavior. Cardinal Siri declared that in the days before the conclave he had sensed a feeling of annoyance on the part of some cardinals. Days passed between feverish negotiations in search of Pius XII's successor. 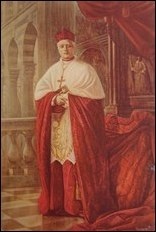 According to several cardinals, Giuseppe Siri was the most suitable person. Other "cardinals" [infiltrator Freemasons] despised the ultramontane Cardinal of Genoa, and formed a cabal to steal the papal throne from St. Peter's Lawful Successor, at any cost. Papal Prophecy of St. John of the Cleft Rock (14th Century):" Towards the end of the world, tyrants and hostile mobs will rob the Church and the clergy of all their possessions and will afflict and martyr them. Those who heap the most abuse upon them will be held in high esteem. At that time, the Pope with his cardinals will have to flee Rome in tragic circumstances to a place where they will be unknown. The Pope will die a cruel death in his exile. The sufferings of the Church will be much greater than at any previous time in her history. But God will raise a holy Pope, and the Angels will rejoice. Enlightened by God, this man will rebuild almost the whole world through his holiness. He will lead everyone to the true Faith. Everywhere, the fear of God, virtue, and good morals will prevail. He will lead all erring sheep back to the fold, and there shall be one faith, one law, one rule of life, and one baptism on earth. All men will love each other and do good, and all quarrels and wars will cease." I did not know that a pope could name his successor! You said this has happened in the history of the Church! Can you give some exemples please?